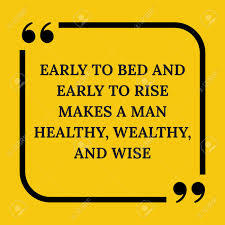 Very tired so “early to bed”; potential customers so “early to rise.” Then (as the saying goes) “healthy, wealthy, and wise.” Working outdoors is definitely “healthy”!! “Wealthy” and “wise” never!! Correction: If we have our health, we have wealth (imho).